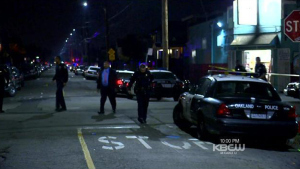 OAKLAND, Calif. - The shooting that injured seven people Monday night, including one critically, began at a birthday gathering, police said Tuesday, reports CBS San Francisco. Officers received reports of a shooting about a block away from Verdese Carter Park in East Oakland shortly after 6 p.m. Monday, Oakland police spokeswoman Johnna Watson said. Police then learned about a second shooting scene nearby when they arrived. Watson said Tuesday that initial reports suggest that two armed suspects approached a group of men who were celebrating a birthday and began shooting at them. One of the victims is now in critical condition, according to the station. The other six suffered non-life threatening injuries, Watson said. The wounded are between the ages of 23 and 31. Police do not have a motive for the shooting and were still trying to determine whether the assailants were on foot or in a vehicle. Oakland police and Crime Stoppers of Oakland are offering a reward of up to $35,000 for information leading to an arrest in the case. Anyone with information is asked to call the department’s homicide section at (510) 238-3821 or Crime Stoppers of Oakland at (510) 777-8572.